MISSOULA, Mont.—Nearly 87,000 people attended the Rocky Mountain Elk Foundation’s inaugural 10-day Hunter & Outdoor Christmas Exposition, presented by Cabelas, Dec. 3-12 in Las Vegas. 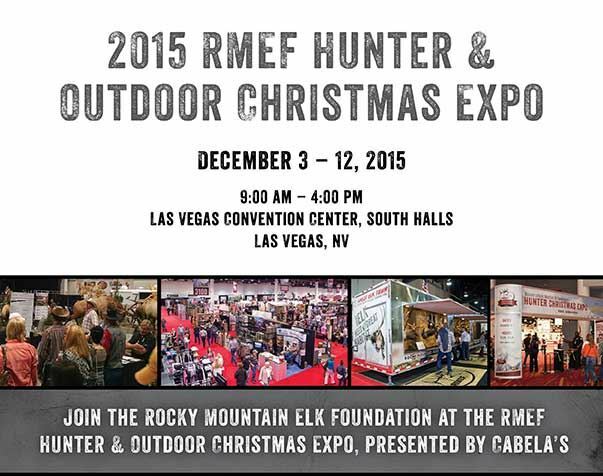 Co-located in the South Halls of the Las Vegas Convention Center (LVCC) with the popular Cowboy Christmas Gift Show, and in conjunction with the National Finals Rodeo (NFR), the final RMEF expo attendance mark is 86,940. The combined event covered more than 900,000 square feet in the LVCC with Cowboy Christmas featuring the best of western lifestyle and RMEF Hunter & Outdoor Christmas presenting the best in firearms, optics, outfitters and guides, hunter apparel, and all things hunting and outdoors. Admission was free of charge. In addition to presenting sponsor Cabela’s, the show featured industry leaders Browning, Federal Ammunition, NRS Trailers, PSE Archery, Polaris, Remington, Winchester, Yamaha and many others. Expo sponsors included Cabela’s, Chevrolet, Yamaha, Alps Outdoorz and Peak & BlueDEF. “It’s important to recognize that were several firsts this year, first 10-day exposition, first time with Cowboy Christmas and first time in the South Halls, among others. And while we’re excited about the success of the expo, we and our partners at Las Vegas Events learned a great deal this year. We will go to work, incorporate changes based on what we learned and be right back here again December 1–10 of 2016 to do it all over again,” added Decker. Founded over 30 years ago, fueled by hunters and a membership of more than 205,000 strong, RMEF has conserved more than 6.7 million acres for elk and other wildlife. RMEF also works to open and improve public access, fund and advocate for science-based resource management, and ensure the future of America’s hunting heritage. Discover why “Hunting Is Conservation™” at www.rmef.org or 800-CALL ELK. Teen hunter Jessica Nielson pursues elk for the first time with the help of RMEF President & CEO David Allen. The month of November proved a success for Into High Country and Project Elk Host, Jason Matizinger and myself while hunting mule deer in eastern Montana. The hunts will air on both Into High Country on the Sportsman Channel and wrapped up the final hunt of the production season for Season 6 of Team Elk. New episodes airing in January on the Outdoor Channel. Kristy Titus, NRA Certified Instructor and Cabela’s Ambassador, is assisting new shooters at the Shoot Like a Girl booth (#110) during the Rocky Mountain Elk Foundation's Elk Camp and Hunter Christmas December 3rd-12th at The Las Vegas Convention Center (LVCC). Titus will be helping shooters at SLG’ state of the art 52’ trailer where the team of NRA Certified Instructors will provide new shooters with a controlled, safe, and fun environment where they can experience shooting sports within a short amount of time. Women are invited to come and shoot pistol and rifle with the military grade simulation system that utilizes real firearms that replicate 80% of true recoil in addition to drawing back a compound bow. The founder and president of the company, Karen Butler, realized that although women are the fastest growing demographic in shooting sports, there were still factors that limited their involvement. Primarily, the opportunity for women to try equipment that fits in a safe and controlled environment. Shoot Like A Girl, with the help of their valued corporate sponsors, travels the country with archery equipment in weights and lengths for women to try at their Test Flights™. They go to events where there are a lot of women spectators, but not necessarily a lot of participants, like hunting shows, conservation shows and shooting sports tournaments. Team Elk member Randy Newberg, along with Randy Martin, hunt public land in Arizona. Randy Martin holds off knee surgery just for this special hunt. Team Elk Host Brandon Bates and country music star Josh Thompson hunt Colorado and find a particular bull with a very distinct sound. Fort Hood Shooting victim Patrick Zeigler finally realizes his dream of hunting elk, after almost losing his life in the 2009 attack. Lifelong friends Bill McBeath and George Berry hunt public land in Nevada, just like they did growing up together. Hunting is a heritage, a legacy that is passed down from one generation to the next. Moments that are lived create memories that are etched into our hearts forever. Time spent afield with friends and family is precious, something that we look forward to from the sunset on the final day of season until dawn on the morning of the opener. The opening week of Oregon’s archery elk season, I was blessed with sharing the mountain with my father Lewis and RMEF’s Team Elk in our home woods of Oregon. It was a week that we revisited hunting memories of the past; the place that I called in my first branch antler bull elk, the place that I filled my first archery bull elk tag, the places that we had close calls and we wish we knew then what we know now places. Stay tuned for season 6 of RMEF’s Team Elk, airing on the Outdoor Channel in 2016 to watch our Titus family public land, DIY archery elk hunt. Former PRCA All-Around World Champion Lewis Feild and PBR CEO Jim Haworth hunt big bulls during Colorado’s rifle season. Airing on the Outdoor Channel Monday at 9:30am, Saturday at 6:30pm and Sunday at 5:30pm EST. Bend, Oregon (September 18, 2015) – On this week’s RMEF Team Elk, Kristy Titus has the honor of taking two well-deserving women on their first elk hunt. Sgt. USMC (retired) Kirstie Ennis, who was severely wounded in a helicopter crash while serving her country and Charlene Westbrook, who lost her husband Sgt. First Class Kenneth Westbrook in the Afghan war, are both featured in this moving RMEF Team Elk show as Titus learns the ups and downs of their life after the damages of war. Ennis’ hunt is thanks to the work of RMEF and Wounded Warrior Outdoors, who gained special access to private timberland in the Pondosa Tract in California for this hunt. [LB1] “She deserves to have people know that we appreciate the sacrifices she’s made for our freedom,” states Titus. Ennis was an aerial gunner when her copter crashed in June 2012. She suffered severe facial trauma, spinal cord damage, damage to both arms and had a left leg limb salvage. Westbrook’s hunt is thanks to RMEF and Adkisson Outdoors, who worked with the Military Warrior Support Foundation[LB2] to make this special Colorado mountain elk hunt happen. Outfitter Grant Adkisson helps Titus and Westbrook spot and stalk a herd of monster elk on their land in Pagosa Springs. [LB1]Not sure how this should be worded. It’s my understanding the Roseburg Resources Company approached RMEF with the special tag, wanting to give it to a military veteran. I believe the local RMEF chapter reached out to WWO for assistance??? [LB2]In both hunts, local RMEF volunteers were involved in making it happen. "There is just something different about hunting, it's an art, it's a learned skill and you get to have that passed down to you by people you really admire" said teen hunter Jessica Nielson as she goes on her first elk hunt with RMEF President and CEO David Allen in New Mexico. Tune into RMEF's Team Elk airing on the Outdoor Channel, Monday at 9:30am, Saturday at 6:30pm, and Sunday at 5:30pm EST. Now, what else do I need? 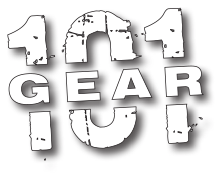 The Rocky Mountain Elk Foundation recently unveiled its Gear 101 gear list, the elk hunter’s essential gear checklist. It is intended for sportsmen and women who range from most avid elk hunter to the occasional. It is divided up in three sections: daytripper, multi-day and outfitted. From there, users can further customize according to weapon, either rifle or bow. Country music artist Easton Corbin is All Over the Outdoors this week on Team Elk. Watch today at 9:30am, Sat. at 6:30pm or Sun. at 5:30pm (EASTERN) on the Outdoor Channel. Johnny Unser takes on Montana during archery season and continues to be one of the most consistent hunters Team Elk has ever seen. Tune in to the Outdoor Channel Monday at 9:30am, Saturday at 6:30pm and Sunday at 5:30pm EST. RMEF Team Elk host, Brandon Bates hunts opening week in Colorado and finds bulls bugling despite the 100 degree temperatures. Airing on the Outdoor Channel, Monday at 9:30am, Saturday at 6:30pm and Sunday at 5:30pm EST. 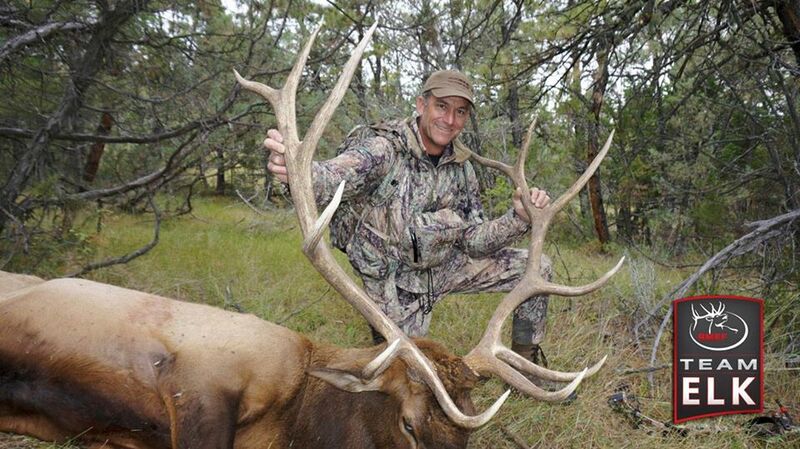 RMEF Team Elk member Randy Newberg, along with Randy Martin, hunt public land in Arizona. Randy Martin holds off knee surgery just for this special hunt. Team Elk airing on the Outdoor Channel Monday's at 9:30am, Saturday at 6:30pm and Sunday at 5:30pm EST.